Just as retailers discount products, markets discount stocks when there is a lack of buyers. Within global equities, the region that has been most heavily discounted this year is emerging markets (down 25% from its peak). Headlines have largely focused on geopolitical uncertainty, trade tensions, and the effects of a strong dollar on emerging market debt. It’s critical, however, to recognize the importance and complexity of emerging markets to find value when prices are discounted. 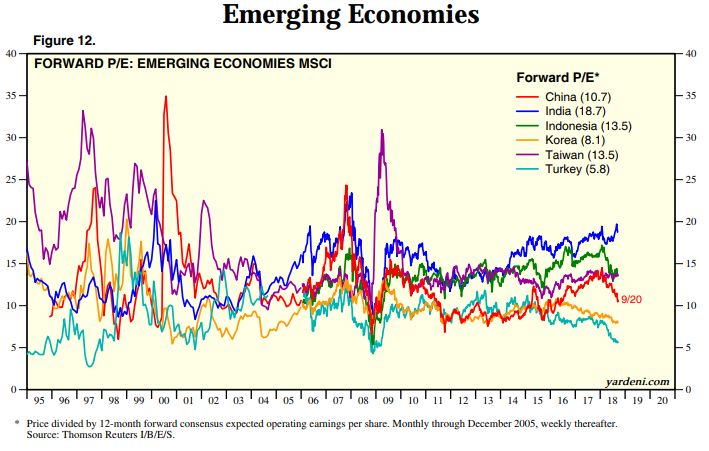 But first, what are the emerging markets anyway? 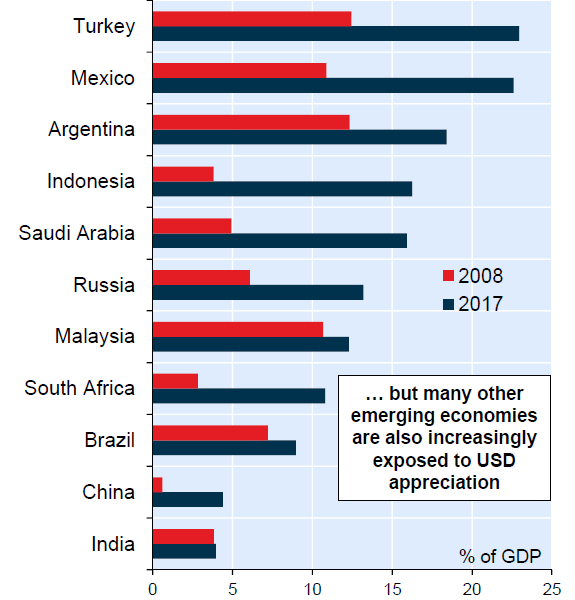 Traditionally, the term “emerging markets” referred to growing economies that were less developed than the mature economies of the US, Japan, and Western Europe. In these economies, political turnover can signal a marked change in fiscal policy and in economic trajectory. Due to the political and currency uncertainty, emerging market stocks typically trade at a higher risk/reward profile than those of their developed market counterparts. The financial media commonly utilize and refer to various Emerging Market indices, the most well-known of which is the MSCI Emerging Markets Index. This index aggregates the distinct, larger economies of 24 countries spread across five continents (table below, data from MSCI) and excludes many smaller markets. Interest rates in the United States have been declining steadily since 1981. 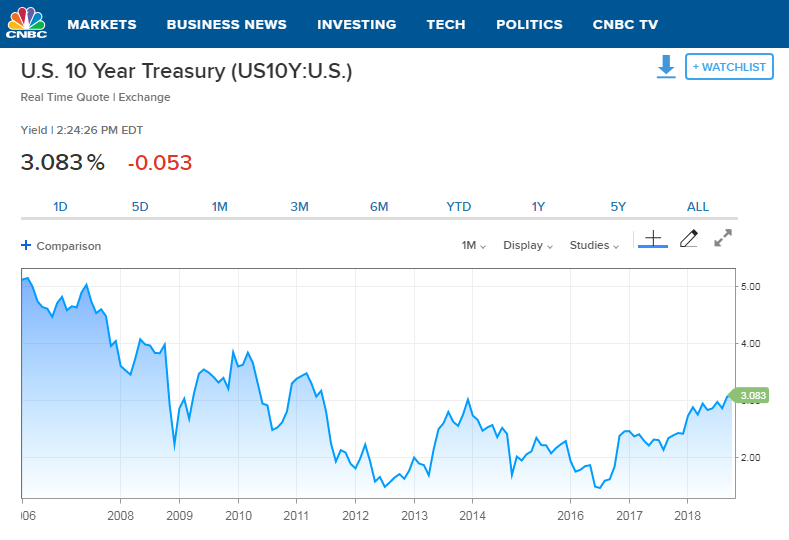 During the aftermath of the Great Recession (post-2007), the 10 YR Treasury fell from 4.0% to 1.5% (see chart below, from CNBC). In the last several years, Americans have been able to borrow at low interest rates to buy their first homes, to refinance their mortgages, and to expand their businesses. 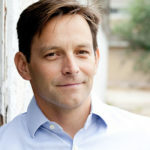 In addition to stimulating domestic borrowing, the attractive low rates in the United States have also incentivized foreign companies to borrow heavily from US banks by utilizing loans that are denominated in US dollars, taking on debt tied to US rates, and agreeing to make interest and principal payments in US dollars. The chart below shows the growth of other countries’ US dollar-denominated debt as a % of GDP. 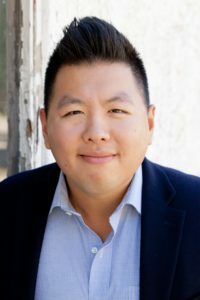 When global investors want to invest in a foreign asset denominated in a foreign currency, they must first sell an equivalent amount of their holdings in their home currency, purchase an equivalent amount of the foreign currency in which their target investment is denominated, and then use the foreign currency to purchase the foreign target investment. 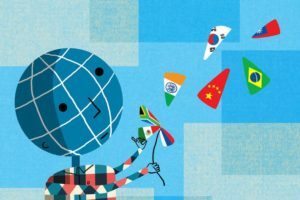 In 2017, emerging markets rallied 31.48%, boosted by a weakening dollar, as global growth accelerated and investors questioned the United States’ economic strength. Foreign central banks moved towards raising rates, unemployment decreased steadily, and investors looked to other parts of the world for investment. As growth prospects around the globe improved, foreign central banks began to reduce (sell) their US dollar reserves and accumulate (buy) other currency reserves. By the end of 2017, it was clear that the Federal Reserve was going to continue to raise the Fed Funds rate, signaling strength in the American economy. Inflation had stabilized at the Fed’s targeted 2% rate. On December 22, 2017, President Donald Trump signed the Tax Cuts and Jobs Act of 2017 into law. Analysts expected that more money in the hands of consumers and corporations would stimulate the economy and make dollar-denominated assets and US interest rates more attractive. This year, the United States sparked trade tensions by declaring tariffs on several other nations, including China, the EU, Mexico, and Canada. These protectionist measures increased uncertainty surrounding future global prospects. When markets become fearful or uncertain, investors tend to flock to the perceived shelter of Treasuries and gold. These “risk-off” investments are denominated in US dollars, so foreign investors must sell their home currency to buy an equivalent amount of US dollars and then use those US dollars to purchase Treasuries or gold, thus, strengthening the US dollar. Despite optimistic conditions in emerging markets, a strengthening dollar and rising US interest rates meant that dollar-denominated debt became more expensive to pay back. No longer were companies borrowing at historically low rates; the 10 YR Treasury sits at ~3%. For certain countries, a ~10% strengthening of the dollar against their currency increased the size of their debt by ~10%. For companies with floating rate debt, a sudden 1% increase year-over-year to interest rates represents a drastic increase to periodic interest payments. However, these interest payments also must be made in US dollars, so add ~10%. The combination of increased interest liability and increased principal liability has ballooned the value of debt on corporate balance sheets in emerging economies and, thus, makes these companies less financially sound and makes their equity less valuable. 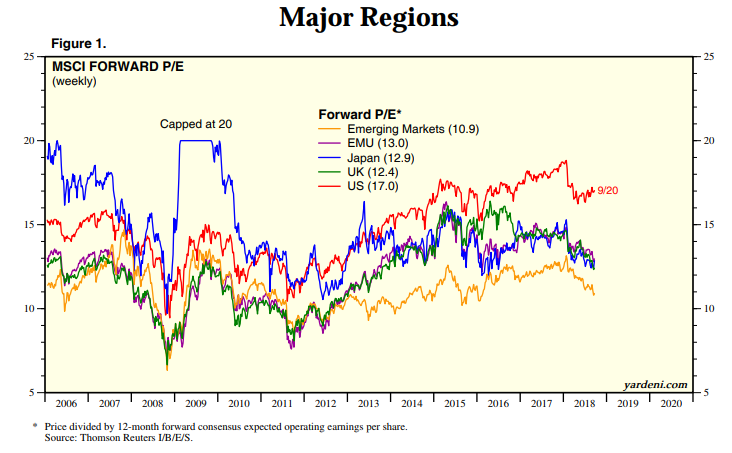 Per Yardeni Research, Inc’s Global Index Briefing, published September 25, 2018, emerging market companies trade at a 10.9x P/E (price to earnings ratio), while the European Union trades at a 13.0x P/E, and the US trades at a 17.0x P/E. It’s also important to examine the dispersion between county-specific P/E ratios. Note, per Yardeni Research, Inc’s Global Index Briefing, the P/E ratios for China and Korea relative to India, Indonesia, and Taiwan. 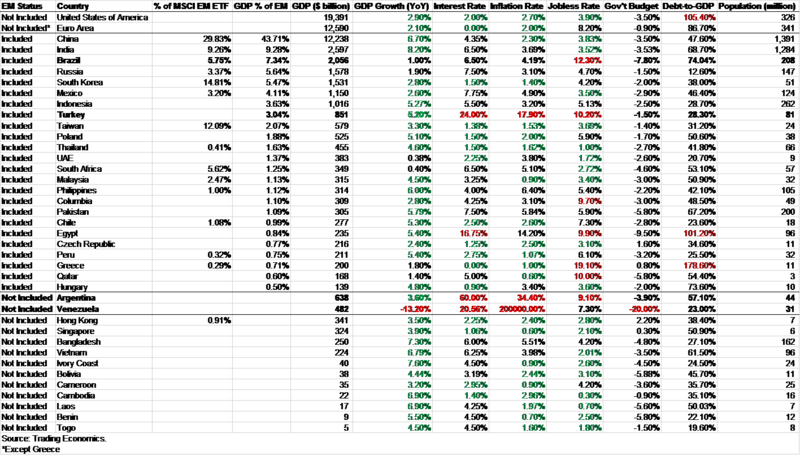 Look closely and you can see that many of the 24 countries that compose the MSCI Emerging Markets index exhibit <4% unemployment, interest rates and inflation that falls in line with developed economies, fiscal deficits, and reasonable debt to GDP ratios (data from Trading Economics). There are also a number of underrepresented nations with smaller GDPs but not-much-smaller populations and similar healthy macroeconomic characteristics: Hong Kong, Singapore, Bangladesh, Vietnam, Ivory Coast, Bolivia, Cameroon, Cambodia, Laos, Benin, and Togo. Population growth is a strong contributor to labor force growth, which is a strong contributor to GDP growth. According to The Economist (2015), Asia will account for half of global GDP by 2050. According to Brookings (2017), by 2030 (12 years from now), 2/3 of all middle-class spending will occur in Asia. 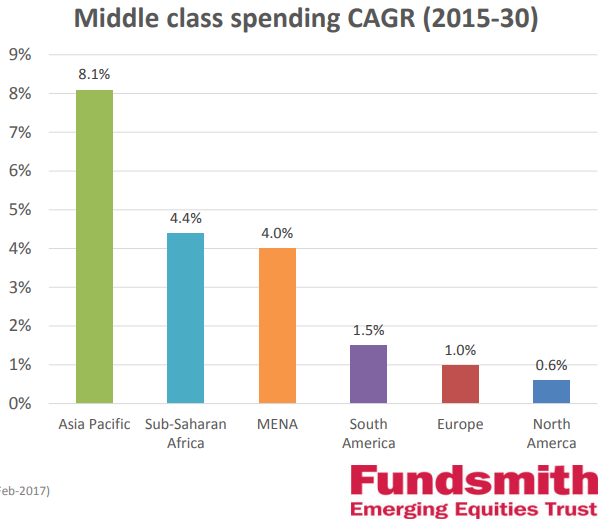 In fact, according to Fundsmith Emerging Equities Trust, in the next 15 years, Asia Pacific middle class spending CAGR (compound annual growth rate) is expected to almost double that of Sub-Saharan Africa and the Middle East. The middle class spending of Europe and North America appears scant by comparison. As the middle class in emerging economies grow, their demand for developed market lifestyles will grow. This will aid the continued expansion of service and knowledge-based economies, which are less constrained by national boundaries. 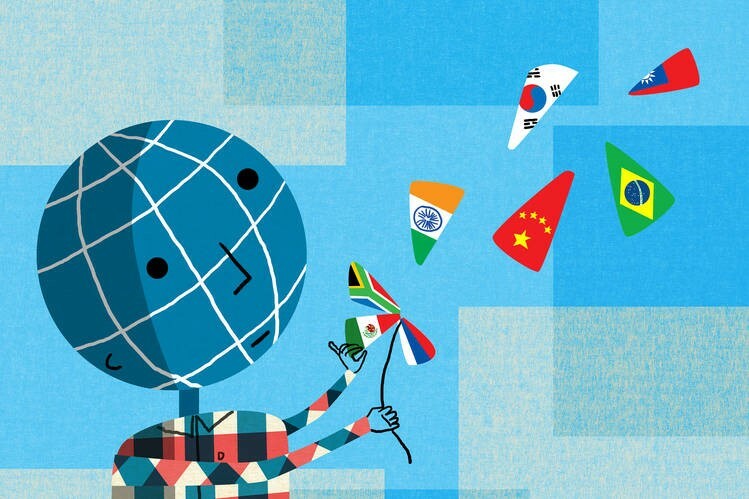 These developing economies’ ability to tap into world markets will offer greater opportunities. Per UBS, in the last decade, luxury car sales in China have grown 18% annually, luxury car sales in India have grown nearly 24% annually, and health and beauty sales are up 22% annually in South Korea. 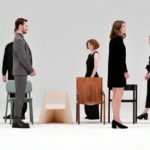 Foreign companies have taken notice. L’Occitane en Provence, an international retailer of body, face, and home products based in France, decided to list on the Hong Kong Stock Exchange in 2010 to be closer to its highest growth regions: Japan, China, Hong Kong, and Taiwan. But the opportunity is not just for Western companies to expand eastward. Another interesting case is Chinese hotpot restaurant company Haidilao, which raised $963 million at an implied valuation of $12 billion on the Hong Kong Stock Exchange less than a month ago. Having already opened restaurants in China, Japan, South Korea, the US, and Singapore, Haidilao plans to open new locations in the UK, Australia, Canada, and Malaysia (Source: Reuters). Another investment professional recently remarked to me, “Trades have short time horizons, investments have long time horizons. All too often, investors mistake trades for investments.” At BSW Wealth Partners, we are long-term investors and, as such, we believe in the demographic and macroeconomic trends and long-term growth of the emerging markets. We feel it’s important to conduct proper due diligence, whether investing in a passive or active fund. Some countries, such as South Korea, exhibit a pricing discount due to geopolitical risk. Other countries, such as China, exhibit a discount due to issues surrounding governance both at the corporate and governmental level. 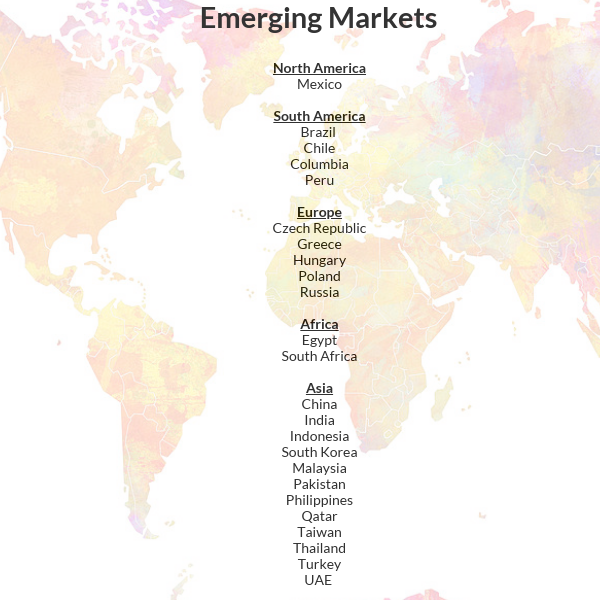 If you pull back the curtain on the most popular emerging markets funds, you’ll notice that many of them don’t list any holdings from Turkey, Argentina, or Venezuela (three countries with political, debt, economic uncertainties/difficulties about which many headlines are written). When investors read headlines, overreact, and trade out of their indexed emerging market positions, they are discounting the stocks of these underlying markets on what may be misguided fears of exposure. By digging deeper, we believe that price and value are reasonable in emerging economies. We feel that the emerging markets are a coiled spring and meaningful reduction in geopolitical uncertainty will ease fear trading and weaken the US dollar, providing a boost to fundamentals. To that end, we have an overweight to broad emerging economies as well as to Asian equities. Over the long term, it’s our belief that the macroeconomic growth prospects, anticipated increasing purchasing power of the middle class, and current valuations make the emerging markets a compelling investment and we believe our disciplined process of rebalancing helps us buy when others may be fearful.